How late in the day can I place an order and still have it ship today? Does Kanebridge have a “dollar minimum” requirement to place an order? Are there any items Kanebridge is not allowed to re-plate? What documents can I access on FasNet™ and how do I access them? How do I access product specifications? I forgot my pin number, how can I retrieve it? Where can I get tracking information on an online order? How do I obtain an invoice copy? How do I cancel an order online? What is the discount for ordering online? When will the 2% discount apply on my order? How do I determine the item’s Country of Origin? How do I place an order for samples online? How do I enter a quoted price online? Is there a way I can add special instructions to my order? How do I change the carrier on an order? How can I confirm the shipping instructions I have on file are correct? How will my order ship if I don't have specific instructions on file and leave it as "Best Way"? The trucking company I want to use is not on the list of carriers; what should I do? Is it possible for me to check for partial cartons available in all branches? If there is no stock (regular and/or RoHS) available in my preferred branch, how can I check the other branches? How can I enter an order with multiple release dates? Can I ship my order to multiple locations or by multiple shipping methods? I have not received my confirmation and can’t locate it online. How can I change or remove a part number(s) that was incorrectly cross referenced in FasNet™? How do I ship the parts back? Who pays the freight on a return? Are there any additional charges with a return? How much time is allowed to request a return? Where can I add notes for my customers? Can I enter a new Drop-Ship address online? My drop ship account is located at the opposite end of the country from me – which Kanebridge branch would the stock ship from? Any order placed by 5:00 PM (local branch time) will ship the same day, provided it ships via one of our regular carriers. One carton of any item is enough to place an order. If you prefer, we can set-up your account so your standard method of payment is a credit card. If your account has other credit terms (such as Net 30) that normally apply, but want to pay for a specific P.O. using a credit card, please contact us. *Steel Nylon Insert Stop Nuts can be re-plated to Black Oxide, Zinc Black or Zinc Yellow. Other secondary finishes on steel or stainless Nylon Insert Nuts cannot be changed. FasNet™ is Kanebridge's safe and secure online ordering system. Customers can search for and purchase products as well as track shipments, obtain invoice copies, look up fastener specification information and much more. Register for a pin number or contact us for assistance. You can obtain invoice copies, packing slips, NAFTA certifications, RoHS certifications, Certificates of Conformance and Manufacturer’s Test Reports (if applicable). Access these documents when you log in to FasNet™ and select “Expedite Orders” from the FasNet™ menu. Please enter the P.O. or item number to view your invoice(s) and click on the invoice number to view your available documents. Product specifications are available when you log in to FasNet™ and click on "Online Specification Guide" from the FasNet™ menu. They can also be accessed by entering the part number on the products page (you must be logged in to FasNet™). If the specifications are available for that part, there will be an “Online Specification Guide” icon next to the product information. Please contact us and we will retrieve it for you. Log in to FasNet™ and select “Expedite Orders” from the FasNet™ menu. Please enter P.O., confirmation or the item number and click on your invoice number(s) to retrieve your tracking information. 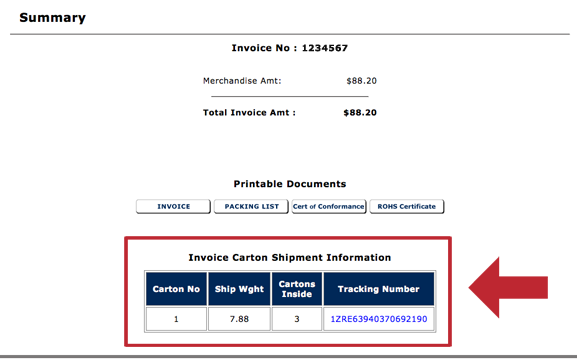 Please enter P.O., confirmation or the item number and click on your invoice number(s) to get a copy of your invoice. Orders cannot be canceled online. Any orders placed online through FasNet™ will receive a 2% discount.